This section was started in an attempt to keep track of Allens that disappear from our records following being SOLD. In the present financial climate many more boats appear to be up for sale. Many remain for sale for long periods, the Register does contact mainly the brokers to inform any owner or new owner of our site, few if informed contact us?, so the following list only reflects the current For Sale boats. Boats that have dropped out of brokeage lists are included as an attempt to retain sometimes the only photo we have the boat. Marked as Sold or Lost to us? The Register has know been running for a period of time and we from time to time get correspondence from owners wishing to sell a boat or others asking about Allens for sale. The Register does not wish to go down the road of becoming any form of brokeage for Allen boats but excepts that the buying and selling of boats is the main reason that boats become lost. So this section is just a pulling together of any Allen boats that are being advertised for sale in a wide area of the boating press and brokerage industry. Owners can place an advent here free of charge or we just repeat adverts appearing elsewhere. Owners and Brokerages are just asked to past on to any new owner the existance of the Register so we can keep track of boats. 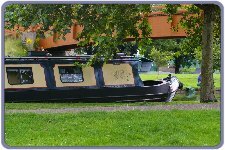 A Photograph of the boat along with brief details are all that is required in this section, links to any other adverts for contact details would be preferred. Rascal No 1:-- BW Number 507241: Length 54ft. Well here is an interesting boat that is the first in a new caterory of 'Boats influenced by the Allens'. 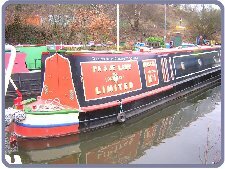 Rascal No 1 was built in Oldbury but not at Valencia Wharf but at Oldbury Boat Services one bridge away. Built after the yard closed in 2001 she looks like an Allen for a very good reason. John Horton who worked at the yard up until it closed in 1997, built her and having built many Allen boats with the Allens when he started up on his own he only knew one style of boat. 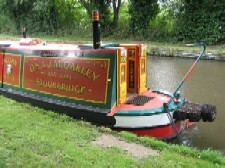 John at first went to Teddesley Boats at Penkidge and built a number of boats for them moving to Oldbury in 2001 after Richard Hurley vacated the boat shed at Oldbury Boat Services. Rascal was his first boat back at Oldury and although John never advertised his boats as Allen replica's anybody in the know knew they were the next best thing after the yard closed. Rascal is powered by a Lister HR2, with a PRM 2:1 Gearbox, swinging a 22"x22" prop. Draws 2ft 6ins. 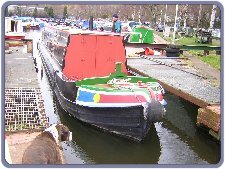 Photographed in March 2008 about to be pulled out of the water at Hawne Basin for her regular blacking. Not seen in all her glory: sorry Phil I did not give you chance to put the chimney on. 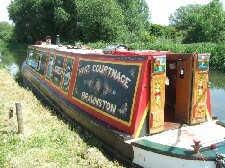 Listed as For Sale on Apollo Duck in the Traditional narrowboat section: Advert No 123228. Another boat we have known of for years but had no photgraph. Photo from Apollo. Has been on our list for a time but we had no photo. Photo as from advertisement details: Many more on sale web site. A 60 foot boat built in 1996 powered by a Lister FR2 with a Blackstone gearbox. Has been on our list for a time but we had no photo. New boat to the Register as to date not listed by us as an Allen boat. But photo looks like an early Allen, hope to get more info. Built in 1992 and fitted with a Rushton Hornsby 2YW engine. In 2005 she was lenghtened by Ray Bowen to her present lenght of 62ft. Photograph taken at Tardibigge gathering of Allen boats, lenght 62ft and new paint job. Is up for sale as a live aboard, having all the equipment required. 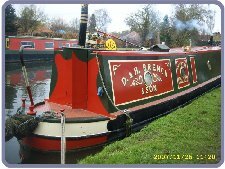 Has been used as a live aboard by her owners who have been Allen Register members since the start of the register. 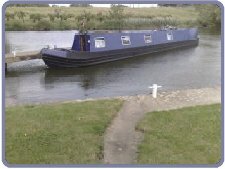 Boat is based in the Yorkshire Area. Another boat listed as up for sale this time at Venetian Brokerage. New to both lists we include her in this section using the photo displayed on the brokers web site. 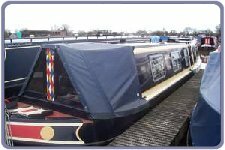 Built in 1985, is 40ft long powered by a Russell Newbury DM2, interior photos on site. Sounds like a good buy to us? Hope to leave message as to the Registers existance with broker for any new owner. Royal Oak:-- BW Number 51409: May 2009 On Apollo Duck as under offer. Powered by another quality product a Russell Newbury D2 circ 1940, that was completly rebuilt by Albert Brookes at the Allens yard in 1991/92 ie a proper job. Fitted out by owner over a number of years this boat must be seen to see its true quality. With a Lister LPW2 7kw generator, Victron 2kw inverter, Rayburn 216M (new 2003) central heating system. 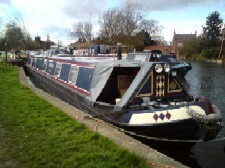 Has been dry docked 2008 to be prepared for sale and will have a full four year BSC from May 2008. Brief info:-Built in 1968 has classic Allen steel hull of the period with a double skin marine ply cabin. Is 70ft long with an air cooled Lister ST3 engine in rear engine room. 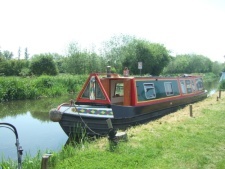 Is also being sold with another boat 70ft in lenght, a butty the both boats having been both a Hotel pair and a residential pair for previous owners. Is at present a residential boat with a possible mooring with the boat. 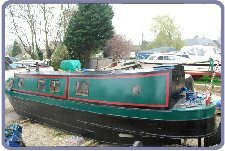 Both boats are up for sale either as a pair or as seperate boats. 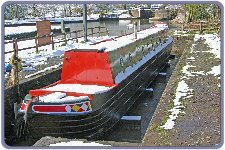 Both boats have been lived on so have full heating systems fitted. Only the motor boat is the Allen so included in this section. For better photo's see Rugby site. Another boat listed as up for sale on Apollo Duck. Advert ID number 91086. 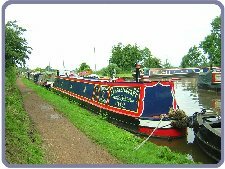 Advertised as a residential boat with possible mooring: Location 2 miles west of Birmingham: mooring has all modern facalities: 62 foot long: Ford Beta Engine fitted 1991: Built 1981, was orginally 52ft. Was when first advertised unknown to this site ie name and number, thanks to Ron who viewed her and updated us, she was listed but we had no photo. Another boat listed as up for sale on Apollo Duck. Advert ID number 90191. 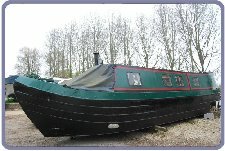 Advertised as a Allen Butty Conversion: 65 foot long: Powered by a Gardner 3LW : Many more details on Apollo. Not on our list as a boat worked on by the Allens, will include in list after some more research. Listed in most records as having a builder as OTHER. Believed just one half of a butty converted by the Allens at the yard. This as her name hints at, is the stern conversion. We also believe that the front end was also an Allen conversion named again we believe just 'Grange'?. Needs more research.